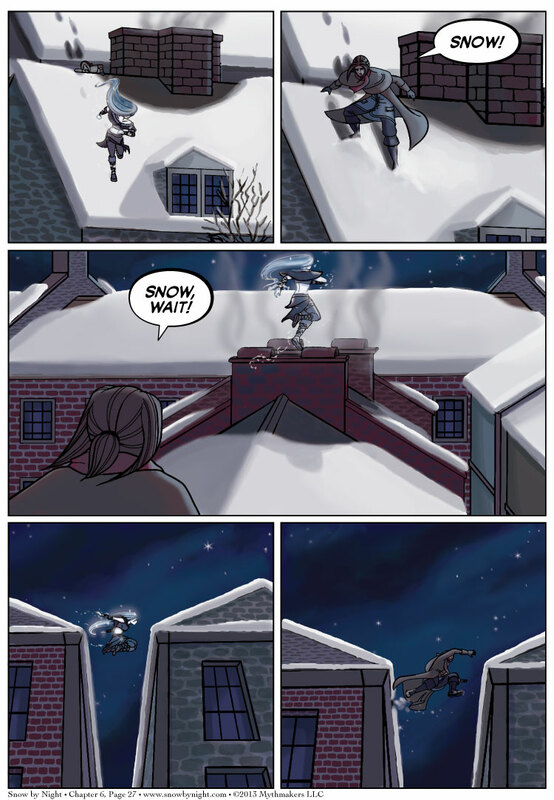 Blaise and Snow-by-Night bound across the rooftops of Sherbourg on Chapter 6 Page 27. To see a glimpse of what awaits them on the next page, please vote for Snow by Night on Top Web Comics. Brittany and I will be attending Animazement this weekend. We’re at table M24 on this handy dandy map of Artist Alley. We won’t have a new page on Monday in observance of Memorial Day. Last week, I added Snow by Night to Tapastic in an effort to reach more people, and has it been successful. Tapastic even featured us on their front page. If you have a moment, please visit our series page on Tapastic and give Snow by Night a rating. The higher our rating, the more notice we’ll get over there. I’d respond, “Of course not, do you disturb yourself?” but given that we’re both reading a fantasy webcomic I suspect the answer is obvious. I suspect that Blaise is about to disturb the snow quite a lot when he misses that jump. And the question is, will that disturb Snow? (Oh my, in my household I’m allowed one pun a month.) 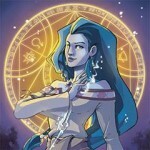 We know a bit about the medicinal powers of ether–hmmm . . . an opportunity for altruism here? Sigh, unless he doesn’t miss it. Not that I would wish an injury on such crush material. Oh, just wait until this chapter’s vignette. I’ve titled it Winter Fantasy. I’m torn as to whether or not Blaise will miss the jump. I’m sure he and Jassart have made such leaps before while running from a job they’ve done. Problem is, the plot might be better served if he does miss it. An easy fix. Link updated. Thank you for letting us know.